I receive hundreds of emails each day and are unable to respond to urgent enquiries through this medium. I hope that this response is not too late. Below is the media statement I released regarding the abolition in the Howard Government of a representative for Youth Affairs. For more information o­n Labor's position o­n youth affairs, please visit this website link http://alp.org.au/media/index.php. If you would like further information, please contact Monika Wheeler in my office o­n (02) 9357 6366. Although o­ne in five teenagers are unemployed and Australia is suffering from a chronic skills shortage, the Howard Government has abandoned youth affairs in their recent ministerial reshuffle. Young Australians aged 12 – 25 make up nearly 20% of the nation’s population and face unique challenges during their transition from child to adulthood. Basic needs such as shelter, nutrition and safety as well as access to quality and affordable education and training are all vital services that the Howard Government is failing to provide to young Australians. More than 45, 000 people under the age of 25 are homeless. And, since 1996 more than 400 000 mostly young people have been turned away from TAFEs and universities. Issues effecting young people should be tackled with a whole of government approach such as in health, education and training – however, the effectiveness of all policies which aim to assist young people must be overseen by a central point and a central representative. Young people want to get skills, be trained and employed. They want to contribute to society like everyone else. Last week, Labor announced the Australian Peace and Community Team (A-PACT) which will give young people the opportunity to assist the underprivileged and under-serviced parts of our Australian and global community for HECS discounts and TAFE scholarships. A Beazley Labor Government will also introduce, as announced today, Skills Accounts which will remove TAFE fees for traditional apprentices. Labor will make an initial contribution of $800 per year for up to four years in an apprentice’s Skills Account.Labor’s new system of Skills Accounts will invest in young people, and help them complete their traditional apprenticeships. It’s time for Federal Government to do more to build the skills and confidence of our young people for the future prosperity of the nation. Labor calls o­n the Howard Government to reinstate a representative to oversee youth affairs, to ensure the unique needs of this age group are being met. I found your name o­n the internet - showing that you have the Labour Shadow Ministry for Children and Youth.I have already emailed the Liberal Party, and also the Family First Party.I have, as yet no answers.Maybe you could help me.I am a member of the Catholic Women's League, and I do the Social Questions for Lakes Entrance, Victoria.We are having a conference in just under a month's time, and we are trying to write a recommendation for this conference.I see in the Age, 23rd Feb. 2006 "Howard's young people are shallow and disengaged" by James Norman, page15 Opinion, that "In December 2004 the Federal Government downgraded the Minister for Children and Youth Affairs, held at the time by Larry Anthony, to the status of a junior parliamentary secretary role.Then just last month, with no fan fair and barely registereging the slightest ripple of protest, the Government scrapped the Youth Affairs portfoolio from the Federal Parliament altogether. "Parliamentarians o­nly reflect the will of the people.I want my resolution to ask that Catholic women go to everyone connected with children and youth and ask that children and youth be well represented in our Parliament.Have you anything to add to this?I need to know very soon as I have a limited time to get this together as it must be ready three weeks before the conference. 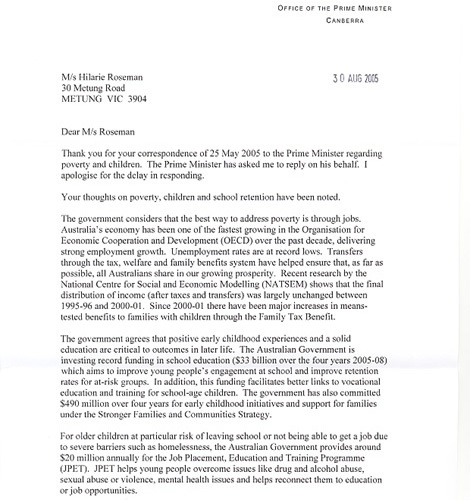 I congratulate you with the reply of the Prime Minister of Australia to your letter to him with an appeal "Making children a priority in Australia". I have published it o­n a page 10-7 of our site. Your government has shown a good example and pioneer initiative in aspect of reacting o­n the letters of the citizens. However it has not seen or has not wanted to see of the gist of your letter. The government has written to you the report that it does in area "of poverty, children and schools", about "growing prosperity" in the country. Really, your government does for well-being of families and children much, but it very far from a priority of children, from priority budget financing of the children's sphere. You asked it. Not the report and actions for creation to children of Australia the priority. The known Australian scientific Professor Brendan Gleeson ascertained that children in Australia, at all their well-being in "growing prosperity", are "fatter, sicker and sadder". The country cities in "growing prosperity" remain for them "not friendly" and reproductive "a sick and hateful childhood". (The Future of Australia's Cities: Making Space for Hope By Professor Brendan Gleeson, Professorial Lecture, 2004). The government has not told about it, as well as about actions in a direction of the priority of children, because it does not plan and does not think of them. Your government, as well as others, are very far from understanding of meaning of the children's priority and furthermore from necessity to do for it something. This misunderstanding fixes absence of the given problem in political thinking. It confirms lacuna in political space of the children interests making from 20 up to 35 % of the population in the different countries, and also interests of children's sphere including up to 80 % of the population: children together with the parents, grandmothers, grandfathers, teachers, doctors and all the caregivers. Hilarie, your letter "Making children a priority in Australia" has the very large meaning because it pays attention and government, and public opinion, and political thinking to this key problem. I think your letter will serve as an example for thousand similar letters of the Australian mothers, fathers, children, youth, female and family organizations of the country, which will force government to see this problem and to begin its decision. At the end its decision depends from citizens, which the governments will follow. Therefore the large and difficult work o­n formation of public opinion concerning a problem "Children first" is necessary us. But I am sure it will be successful and this topic becomes by its major question soon because in all countries the economic progress is accompanied by social regress and deterioration of quality of a human and social capital. o­nly priority of children can break this pernicious tendency. Leo Semashko has received the Government of Russia reply from December 23, 2005 from Department of Motherhood and Childhood of the Ministry of Health and Social Development o­n his letter from September 1, 2005 to the President of Russia Vladimir Putin with an appeal “Making children a priority in Russia”. Unfortunately, the reply is o­nly formal character of the report about the Department’s work.